32MB RAM, 800MB Hard Drive space, 4x CD-ROM, 4MB DirectX certified graphics card, keyboard & mouse. 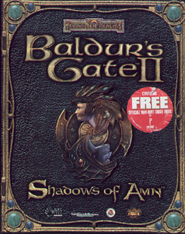 Baldur's Gate II - Shadows of Amn is the computer game sequel to Baldur's Gate from Interplay. 'Baldur's Gate II : Shadows of Amn, the next installment in the Baldur's Gate saga. This second installment in the Baldur's Gate series is as rich in Forgotten Realms lore and history as possible. Our writers and designers have created a story with far more depth and intrigue than was previously seen in Baldur's Gate. The intricacies of the quests and the complexity of the game world has been increased dramatically from the original, creating a gaming richness that will win over the seasoned adventurer as well as the newcomer to the series. See also the Baldur's Gate II Novel, Guidebook and Official Strategy Guide. Check out the official Baldurs Gate II web site. Baldur's Gate II was also released in March 2001 as a Collectors Edition. This was in the format of a large 2" deep bos containing the original game CD and manuals and contents as originally released, PLUS: a classic-style BGII T-shirt, poster, 2 postcards, 19 trading cards and an addional CD containing the games soundtrack. See also the Baldur's Gate II - Enhanced Edition. This game is fantastic. There are of course issues with it as with any game, however the story line is excellent, the character development is great and the in story romance brings an extra twist to the game. I have finished the game twice and still not been able to complete all of the quests. This is a definate plus to me as beginning again will bring new possiblities for quests. I must admit that I used shadow keeper(a game cheat) to ensure victory, Even with the cheat the game was very tough(I didn't get crazy with it). Overall an outstanding game. The game was very good, but in my opinion, it is very disbalanced, you are as powerful to challange Elminster and actually win!, even Drizzt is not a menace for you when you reach the highest levels. The whole idea was excellent. Unfortunately, this game is based in the AD&D 3rd edition rules, I have to say that this ruins the game. I like the fact of having powerful characters, but becoming so powerful in that short time? That's exagerated. Anyway, it's a fun game, but I personally enjoyed more the first Baldur's Gate, there you had to explore the forests and other areas, here you just go to location to location, in the first edition you had to discover the areas, you had to explore to reach Ulcaster's School.